God gave Moses ten very important rules to live by, called the commandments. This means we should make God the most important thing in our lives, above anything else. Saturn has 12 rings, made up mostly of chunks of rock and ice. The first computer was called the ENIAC. It wasn't like any of the fancy computers we have now with big colored touch screens! It was a whole room full of wires and lights and could only do math problems with numbers. This might not seem like much, but it could figure out over 350 problems like this in less than a second. Way faster than most humans! The upper seven vertebrae that connect your head to your shoulders are called the cervical vertebrae. The electricity for your light bulbs, comes from wires in the ceiling and walls. Those wires go through the walls and end up in something called an electrical box, or breaker box. In many homes it's found in the basement. All the wires go into the electrical box, and there are switches like a light switch that can turn the electricity off for the whole house! The electricity comes into the electrical box from big wires that that go all the way back to the power company. If this is hard to remember, you can try to remember that they connect your vertebrae in back to your sternum in front. 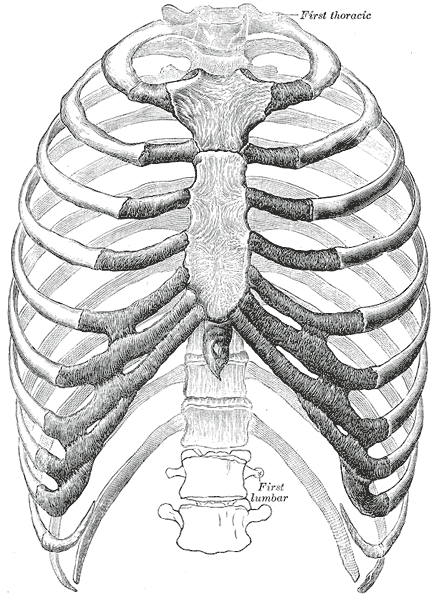 The human rib cage is made up of 24 ribs (12 on each side) and is also known as the thoracic cage. The hard bone in the middle of your chest that connects your ribs together in the middle is called your sternum or breastbone.